As you browse our website you will notice that each and every apartment development is expertly furnished, beautifully decorated, and elegantly styled. So how, when you move into your new apartment that looked so enticing in those renders, can you ensure it looks just as good in real life? Looking back over 2017 and all the picture-perfect apartment developments that launched to market, we identified a few interior decorating trends. So while you might not be able to discover that gorgeous lamp’s product id, or even find out what brand it is (and of course, it might exist only in the world of renders, and not be shoppable at all), all hope is not lost. Simply use our room-by-room guide below to direct your styling and shopping decisions so you can find lookalike furniture and decor that does exist in the real world. Most development showcases will open on a grandiose shot of the exterior. Swipe right and more often than not you’ll be shown a beautiful landscape shot of the spacious, open-plan living area – the hero in this shot being the enormous sofa. If you take some time to examine some of these living room shots from a few different developments you’ll find that most of these hero pieces are in fact oversized, grey and beautifully textured with grand cushions and blankets, low armrests and a chaise lounge extension. Pop into any modern furniture shop and you’ll be met with a few variations to choose from. Select a couch that is as big as will fit in your living area without overpowering it, and choose something that can be configured for different moods and uses. A thick, oversized book about your favourite artist or fashion designer on a low coffee table goes a long way too. In the renders, the kitchens always look supremely elegant. Nothing is on display save an artisan chopping board, and perhaps a decorative little pot plant. In reality, of course, this vision of simplicity is hardly achievable – unless you want to spend as much time taking everyday items in and out of storage as you do actually cooking. But by adopting a minimalist approach that doesn’t fully encroach on your culinary style – think herbs and spices neatly tucked away in the cupboard, and a coffee machine that sits in a designated nook – you can get close to the mark. Getting a kitchen designer in to help you achieve the perfect look is always an option. Being a bathroom, little furniture is actually required here. The look will essentially be made up of a spacious, walk-in rainforest shower (or a freestanding bath if you’re lucky), the vanity area and the all-important tapware, leaving little to your creative influence. But do make sure that you deck the place out with some Aesop soap, scented candles, and luxuriously fluffy towels that strictly match each other and the room’s overall colour scheme. A low wooden stool is great for a touch of natural materials. And as with the kitchen, keeping surfaces clear and all items neatly stored behind cupboard doors is paramount. Like the bathroom, the bedroom requires very little decorating. The bed, of course, is the biggest choice you’ll have to make. Modern renders are chiefly showing frameless beds with a comfortable headboard and a sophisticated choice of bedding. The addition of a couple of decorative cushions is the final touch to create that render-perfect appeal. For a finished look, some bedside tables (strictly kept clear of any night-time water, books, phones or any other misfit items), with distinctly modern bedside lamps are perfect. Space permitting, a vintage armchair (in pristine condition of course) positioned in the corner of the room goes a long way. 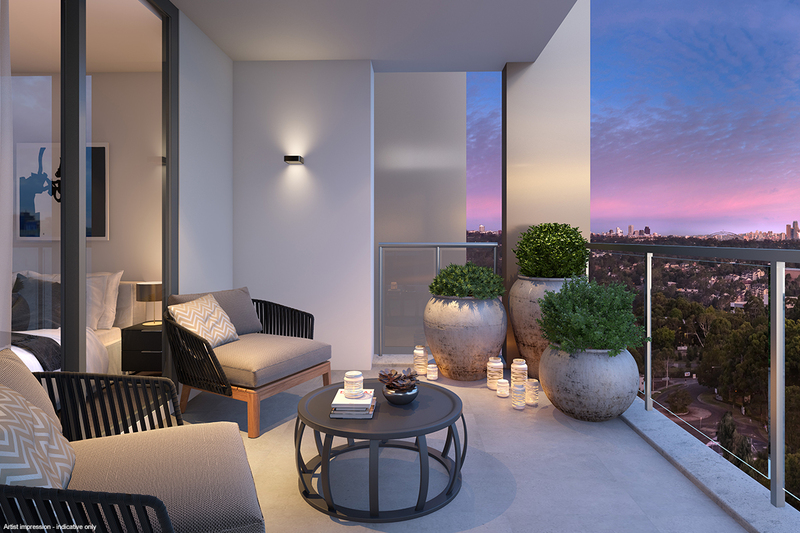 The balconies in apartment renders always look absolutely stunning. The sun has just gone down, setting the sky alight with all the gorgeous pinks, purples and oranges of dusk and the city skyline is perfectly outlined with its twinkling lights. Luckily, Mother Nature will take care of the backdrop for you. What is actually on the balcony, looking so glorious in that light, is where you need to work some magic. An inviting seating arrangement – be that some lounge-type chairs or a full dining situation – is the centrepiece of your beautiful alfresco area. Less obvious and often forgotten is the inclusion of a careful arrangement of pot plants in the corner, and the lush, flowering vines growing around the space. These elements of life are what elevate a balcony from boring to beautiful. It’s as simple as a trip down to Bunnings on a Sunday. Determine your ideal interior style and start your hunt for lookalike furniture and decor that will give your apartment that showhome appeal today. Needs some more interior decorating inspiration? Browse our beautiful apartments all over Australia here.